Because I stayed till the bitter end of the session with Bob Johnston this morning—see “Report from the Treasurer Q&A”—I missed the beginning of the 10:30 service, so I decided to go to the Refuge service tonight. It is no secret that Refuge is not my favorite service, but I resolved to be as objective as possible in assessing the Refuge experience. 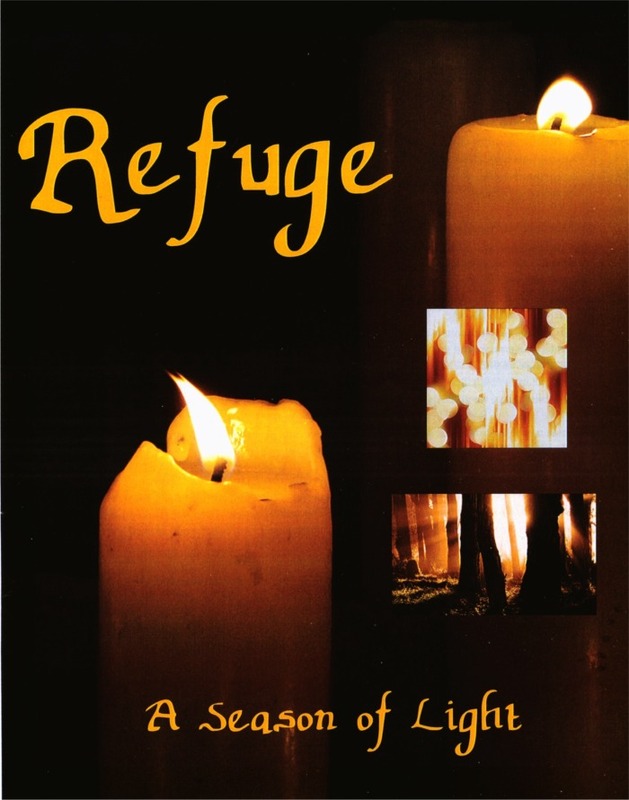 Actually, I think Refuge has potential, even though I question its staging at a suburban church. I almost like Refuge in principle, but I believe that lots of the specifics of its presentation need improvement. Rather than give a general review of the service, I will mostly note the things I think need improving. Recorded music was playing when I entered the church. This was tacky, but the music was pleasant. When it was time to start the service, however, the music was abruptly cut off. This was unacceptably tacky. These things can be timed. The church is still too dark. I changed seats in order to be directly under a lantern, but I still had problems reading the service bulletin. This is not welcoming! More thought should go into lighting. Using more light in the side aisles might obviate the need for more light directly in the nave and, psychologically, might make the nave seem darker when it is actually brighter. The floodlights behind the arch at the back of the chancel might be put to good use, if only to dispel some of the spooky shadows above the reredos. The fabric draped here and there seemed rather arbitrary. Some of it makes sense; some looks, from a distance, like a mess of spider webs. The narrow vertical hangings were just so much clutter. The incense was intense enough to be perceived without being overwhelming or stifling. Why don't we use the pew torches? They provide light and look nice. I don’t like the way people spread out. I would rope off the pews from the middle of the nave to the back in order to make people sit in the general vicinity of one another. The prayer book, in many cases, breaks up text said together into short lines. This is done for a reason; it telegraphs where pauses should be inserted and helps a congregation read more effectively in unison. The Refuge service booklet does virtually none of this. It should. The service booklet says nothing about when people should stand, sit, or kneel. Mabel, who was leading the service, was of little help in suggesting what people should do. I wasn’t sure whether to do what my Episcopal intuition suggested I should do or do what everyone else seemed to be doing. I went with the latter, but I wasn’t comfortable doing so. There was no real passing of the peace. Why not? I found the musical interludes inserted without warning somewhat distracting. This may not be a fair criticism, but it’s what I felt. Sound continues to be a problem. I could not hear the lessons because of noisy children. (I don't think Refuge is much of a children’s service.) By contrast to the spoken word, the music was generally too loud. Music needs to be toned down—sound reinforcement, not amplification should be the goal, and the spoken word requires microphones. Preaching should be done slowly and with as low and soothing a voice as possible. I did not like the fact that I could not see the musicians. They should be in a more conspicuous location. Moreover, the nature of the amplification produced a certain cognitive dissonance; I knew they were in one place, but the sound came from somewhere completely different. I heard virtually no one except me and one other person singing. Whatever we’re doing encourages an audience, not a congregation. The music at the end of the service seemed to go on interminably. This was not endearing. If it was meant to accompany the departure of the congregation, no one seemed to know it, as everyone stayed until the music was over. I had a strong desire to get on with life. The amounts listed as short-term portion on the balance sheet represent the total principal payments on each loan that will be due during the coming twelve months. The amounts listed as long-term portion are the principal payments that are due in subsequent years. Actually, this is very interesting. According to the balance sheet on page 14 of the annual report, our two loans, as of the beginning of this year, had a total outstanding principal of $65,701.86. Why, then, did the diocesan Growth Fund give us a loan to “refinance” our loans to the tune of $69,900? (See parish announcement here.) What we doing we doing with the excess of more than $4,000? Does the diocese know there is an excess of $4,198.14? Principal payments are shown separately since they are repayments of amounts on the balance sheet and are not an expense to the church (they are a cash payment, however), but interest costs are an expense to the church, as well as a cash payment. Although I don’t pretend to understand this logic, it does explain the $17,677.97 payment in the cash flow statement on page 19 and the similar, but negative, figure on page 18. It was not intuitively clear to me that “PNC and Diocesan Roof Loan Payments” on page 19 represented only the principle payments. Such payments should be labeled as principal payments in the future. Question 3: Because of the lateness of the hour—I want to get this posted tonight—I am going to reproduce Bob’s response first and make only a small comment on it. This $25,000 was initially a loan from the Contingency Fund until it was determined that we would not have any excess cash at the end of 2010 to repay it. At that point, the decision was made to "write it off," or in other words treat it as a permanent withdrawal from the Contingency Fund. It would not be classified as revenue for the operating fund but would appear on the balance sheet for the operating fund as a liability to the Contingency Fund, if we had decided that we intended to pay it back in the near future. Interest income, of any type, is a true income item for any fund, so the interest income of the Contingency Fund needs to show up somewhere as income and we always transfer it to the operating fund as income in that fund. I don’t understand the surplus of $13,472.96 that you mention. As shown in the Operating Fund Statement on page 15, the operating fund has a deficit of $11,527.04 after loan principal payments. As you will also see on that same statement, there was a surplus realized, prior to loan principal payments, of $6,150.93. We have chosen to supplement the operating fund statement by including the loan principal payments, even though they are not expenses (rather the repayment of an amount borrowed), because we believe it shows a more complete picture of our cash deficit. I am not sure which "special funds" you have included, so I cannot recomputed the net loss of $600 that you mention. There is no intent to obscure our true finances in order to reduce our assessment liability to the diocese. I am not sure why you say more and more items are being removed from the operating fund. The only item I am aware of removing in the past couple of years are the Children and Youth costs and we did that because we received special contributions from the Cotillion Fund specifically for Children and Youth costs and we felt it was only proper to segregate those amounts in a separate fund to which we charge expenses for Children and Youth. There has not been a discussion as to how the Salary Restoration Fund donations will be treated for revenue purposes. Question 5: Bob said he has to check on this. Apparently, the money is not in an interest-bearing account. Why not? Question 7: Bob did not know who was paid $1,000 out of the Friends of Music account. Apparently, Virginia Schaap is the Music Guild Administrator. Her duties seem to include publicity and soliciting funds. Question 8: Bob could not explain this figure fully, and said he would have to consult with Kris. He suggested that staff time to prepare bulletins and the like might be included here. If this is the case, why does it not show up in Refuge Service Fund revenues? Question 9: I think I will just reproduce Bob’s answer here. At this point in time, given our budget position, we do not anticipate providing any support to Old St. Luke’s. It is up to Doug where he saves $2,100 in the music area. He is given that budget and needs to adhere to it, unless he comes to the Vestry for authorization to spend more. As part of the process of determining the best way to balance the budget, it was decided that Music was an area we would look to for savings. Question 10: Again, let me just give Bob’s answer, which includes information I did not know. I will have to get back to you on what the budget is for Refuge in 2011, but we have already received a grant from the diocese for 2011 expenses. I will confirm that amount, as well. You should ask Kris and/or Lou this question. I have not been intimately involved in discussions about Refuge. Bob also provided answers for the questions in my post “Questions for the Treasurer.” His answers to these questions were particularly helpful, and I have no need to elaborate or comment on them. I reproduce them below. The basis of the requests made in 2010 was that we were projecting a deficit and did not want to decimate our Contingency Fund by using a large portion of it to cover the deficit. Having no endowment fund to tap for income, we were in a tough situation. Early in the year, we requested a $6,000 reduction in our assessment. The Budget and Assessments Committee of Diocesan Council deferred action on that request and asked that we approach it again later in the year, if our financial position worsened or we determined that we still needed the $6,000 based on actual results further into the year. In the fall, we felt that our position had worsened, based on projections for the balance of the year. We therefore approached the Budget and Assessments Committee again, with a higher request (around $12,000, if I recall correctly). In the end, we were granted a reduction of $10,600. That amount represented two months of our assessment. We anticipate requesting a small reduction in our 2011 assessment based upon our current budgeted income being lower than the average of the last three years. The calculation of what we will request is based upon the diocesan formula for determining assessments and applying that formula to our projected 2011 income. As you know, St. Paul’s has two loans outstanding. One is with the Diocesan Growth fund at 3% and has about 4 years left on its term. The other is with PNC Bank at over 7% but I do not know the number of years left on its term off the top of my head. It was the amount borrowed when we renovated the Nursery School area and purchased the organ. In order to conserve cash by spreading the payments over a longer period of time and paying a lower interest rate, we decided to apply to the Growth Fund for a loan to refinance these two loans. This week, we were granted a loan of $69,900 (amount owed on the loans as of the beginning of 2011) at 3% interest with an amortization period over 10 years and a balloon payment at the end of 5 years. Our intention is to pay off this loan with the first proceeds of the anticipated capital campaign in the next 12-18 months. See my comments to the first Question 1. This entire amount represents our diocesan assessment, national church assessment and Growth Fund contribution. We classify this as Mandated Outreach, as you will note on page 18 of the 2010 Annual Report, as it is money used outside of St. Paul’s to support diocesan programs, national church programs and Growth Fund activities. Question 4: Bob sent a spreadsheet with the requested information. "Everything You’ve Ever Wanted to Know about St. Paul’s Finances, But Were Afraid to Ask" led by Treasurer Bob Johnston, will be held on Sunday, February 20 during the 9:40 adult formation time in the back of the Parish Hall/Undercroft. Please join Bob for this question and answer session about our parish budget and finances. I had a long list of questions I was not allowed to ask at the annual meeting—see “Questions for the Annual Meeting”—most of which are financial. I hope to get answers to those financial questions on Sunday. I have some additional questions I will list here. I invite others to suggest issues I may have missed. In the past year, St. Paul’s made several requests for reduced parish assessment. What was the basis of these requests? How much of a reduction was requested, and how much was granted? Are additional requests for reductions anticipated? If so, on what basis? A diocesan newsletter this past week contained this item: “The Growth Fund also approved a request from St. Paul's, Mt. Lebanon, for a restructuring of its debt.” Can you explain? In the monthly financial statement in The Messenger, a large expense is “Outreach.” My understanding is the the major part of this is our diocesan assessment. Please list all items that make up the Outreach figure and justify their inclusion in the category. Please provide a complete breakout of “Total Personnel Commission,” which, after all, is the largest piece of St. Paul’s’ budget. N.B. I have made Bob Johnston aware of these and earlier questions. I happened to pass St. Paul’s this morning and was gratified to see men working on the sidewalk and steps around the Mayfair Drive entrance to the narthex. No work has been done there in quite some time, which, I assume, was the result of inclement weather. I hope that we will soon be able to use that entrance again. The yellow tape and overturned orange barrels have hardly been a good advertisement for the church. Regular readers know that I have some pet peeves regarding language at St. Paul’s. Like many parishioners, the renaming of the undercroft as the “parish hall,” a change of absolutely no utility whatever, is galling. Likewise, the constant repetition of our slogan about being welcoming is both annoying and embarrassing. Happily, there is some progress on the language-at-St.-Paul’s front. Although Lou apparently cannot bring himself to say “undercroft” without additional qualification, the word “undercroft” is showing up with greater frequency. For example, in the news for the week of February 13, we find this sentence: “Pat McKeone will be selling tickets during the coffee hours this Sunday, February 6, in the Parish Hall/Undercroft” [emphasis added]. Lou frequently juxtaposes “parish hall” and “undercroft.” Doing so is irritating in its own way, but, to the degree that it recognizes that our congregation had a history before he arrived, it is mildly gratifying. Since, at the beginning of the 10:30 service, I am usually lined up with the choir in the hallway, I generally don’t hear Lou’s welcome before the service begins. For a very long time, he had been greeting worshipers and identifying our parish as “the most welcoming congregation in the South Hills for all generations.” Someone had to point out to me that he is no longer doing that. Good for him! The announcement was like one of those irksome ads one has to endure on the Web before being allowed to watch a video you want to see. One other peeve is worth mentioning, namely, the capitalization of the names of rooms in the church building. (I was reminded of this practice at St. Paul’s while researching this post.) Why do we have a “Lounge” or “Parish Hall”? These terms are generic and do not deserve capitalization. On the other hand, something like “Chapel of the Good Shepherd” does deserve to be capitalized, as it is a specific, rather than a generic name. This practice is one of longstanding, and it’s time to put it to rest. Bryan Sable has e-mailed choir members to provide on update on the fire reported here yesterday. (See “Bryan Sable’s Rental Property Burns.”) Unfortunately, he reported that his tenant, Denise Huss, lost everything and did not have renter’s insurance. (Renters take note.) Apparently, Ms. Huss has a house in Akron, Ohio, but she was living in Wheeling and working at Wheeling Downs. Bryan will skip rehearsals at St. Paul’s tomorrow, but he will return to work Sunday. A two-story home in Wheeling, W.V., owned by our musician Bryan Sable burned in the early hours of Monday. The house was a total loss. The tenant, Denise Huss, escaped but saved only her pajamas, purse, and cat. The cat, Opie, was credited with waking Ms. Huss from her sleep when the fire broke out. The incident was reported by WTRF-TV. The story and video is on the station’s Web site here. Because the lines are so faint, it was difficult to tell if my car was in a parking place or not in St. Paul’s’ parking lot this morning. Thursday night, when I went to church for choir rehearsal, it was simply impossible. It has been a big week for diocesan news. As I observed a few days ago—see “Lots of Diocesan News”—our own diocese cut a deal with a breakaway church that will become independent of both the Episcopal and Anglican dioceses. And, of course, the Commonwealth Court rejected the appeal from the Anglican diocese to the decision that awarded diocesan property to our diocese. This blog is reserved for concerns about our parish, but, since parishioners should be interested in our diocese as well, I wanted to mention two other pages you might like to visit on the Web. Our diocese sent out an e-mail message explaining the week’s events. You can read that here. If you subscribe to the diocese’s weekly electronic newsletter, you should have already seen this. If you are not subscribed, you may want to do so. Just go to the diocese’s Web site and look for the place to enter your subscription to “Grace Happens” under Featured Parishes on the right side of the page. On my own blog, Lionel Deimel’s Web Log, I have written an essay about how Archbishop Duncan’s diocese is reacting. You can read “Why Bother?” here. I have learned that the Pickerings arrived home in Richmond, Virginia, from Cairo at 8:30 yesterday morning. Thanks be to God. There are two big news stories about our diocese today. First, the diocese has reached an agreement with St. Philip’s, Moon Township, a parish that went with the Anglican diocese when the diocese split in October 2008. St. Philip’s will, by this agreement, become an independent church. The bigger story is that the appeal to the Court of Common Pleas to award diocesan property to the Episcopal Diocese of Pittsburgh has been rejected by Commonwealth Court. Make no mistake, these are both big stories. Details will be forthcoming from the diocese this week, but most of the information you will want to know are contained in the posts listed above.